The other day I got asked on advice on what to do and see in Australia. I decided to take that up and do a 10-Days-Special on Australia. And as I already did one post on Sydney, Part 1 starts with Melbourne. I’ve been to Melbourne twice in 2007. First time I went in May 2007 with a tour from my university’s sports club. I went back in November 2007 with my dad and I saw a bit more. 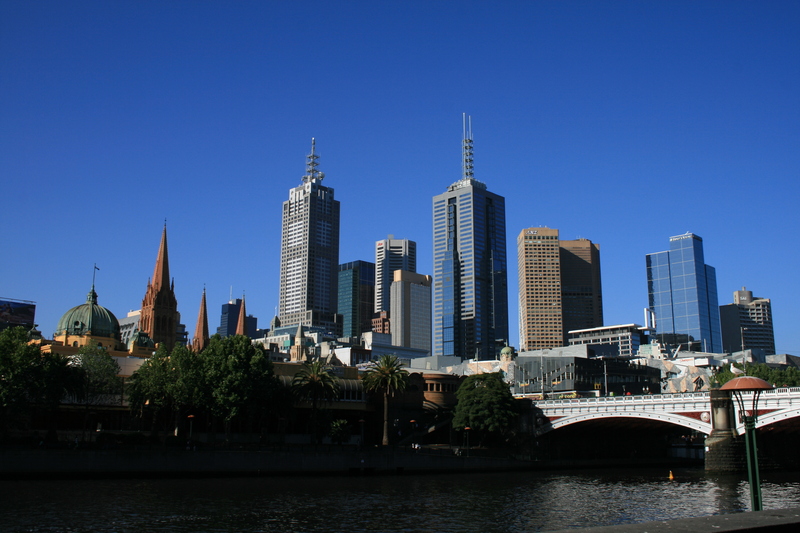 Both times we mostly took walks through the city and along the Yarra river enjoying the atmosphere and the view which is really good especially from the Northern side. Melbourne has a trendy vibe, yet it felt far more relaxed than Sydney did. The “ornate Victorian-era architecture and leafy, established boulevards reflect the city’s history, and cutting-edge developments such as Federation Sq exemplify its enigmatic contemporary style.” says Lonely Planet and I can only agree. As most things are easily reached walking, it is nice just to take a stroll and see all the different faces of the city, be it the fancy university building in the city center, Federation square where you can linger and, as we did, sometimes listen to concerts or check out an exhibition, or the beautiful Flinders St. Station. And then there are the old trams. Going on them is a bit tricky as many tourists and some local try to take them as well, but it is worthwhile still. While walking through the city you’ll most likely come by Centre Place and Degraves Street (near Flinders St Station), little cobble stone alleys. Here you can grab a coffee or maybe lunch. We had great Chinese takeaway there. And for dinner head to Lygon street, the Italian food precincts of Melbourne. 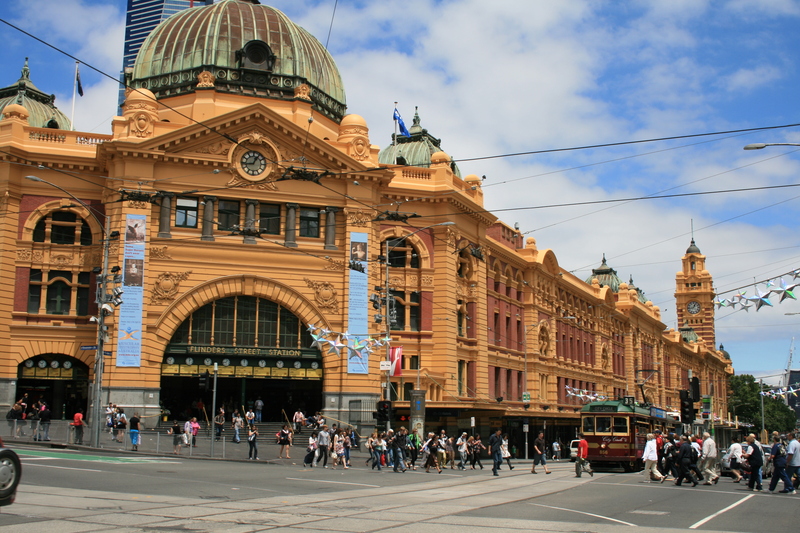 I checked my diary from back them where I noted: “We went to Lygon Street for Italian food. We had pizza at Mercadante and they had the best pizza that I had so far in Australia. Just so yummy!”. I think it would be worth checking if that is still so. Melbourne has beaches as well but both times that I have been there, it wasn’t real beach weather, so I can’t say much about famous St. Kilda. 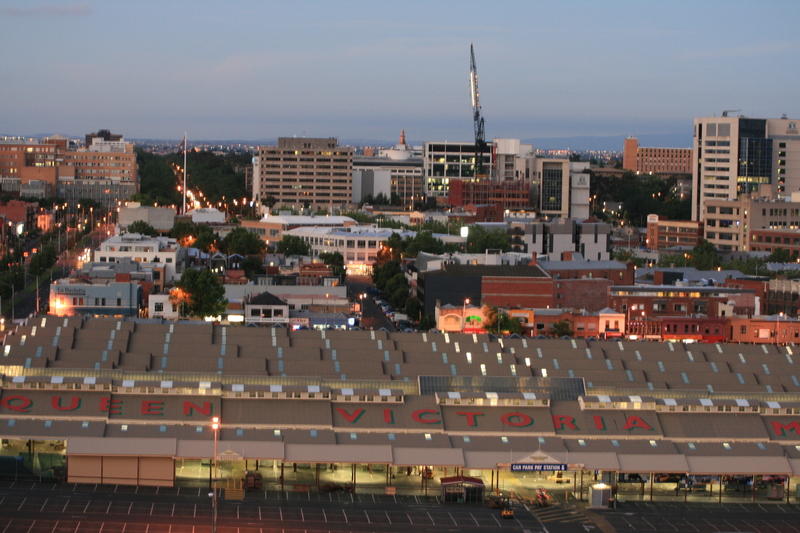 But other than the city center something that stayed in my memory was Queen Victoria Market. Not that it had extraordinary things that you could buy, but it was just fun to walk the over 130 year old halls. And if you are into sports, you could also go an watch an Aussie Rule Football match, as we did in our tour with the sports center. If you want to explore further, get a car or hop on a tour bus for a trip along the Great Ocean Road. It can be done in a day trip but if the weather is nice, it’s well worth going for two days and staying one night somewhere along the Great Ocean Road. This entry was posted in Australia and tagged Melbourne by kathatravelling. Bookmark the permalink.